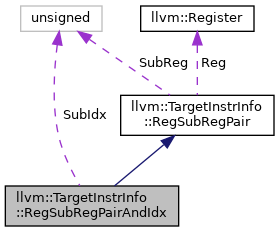 A pair composed of a pair of a register and a sub-register index, and another sub-register index. Used to give some type checking when modeling Reg:SubReg1, SubReg2. Definition at line 443 of file TargetInstrInfo.h. Definition at line 446 of file TargetInstrInfo.h. References llvm::TargetInstrInfo::getExtractSubregInputs(), llvm::TargetInstrInfo::getInsertSubregInputs(), llvm::TargetInstrInfo::getRegSequenceInputs(), MRI, and llvm::TargetInstrInfo::produceSameValue(). Definition at line 444 of file TargetInstrInfo.h. Referenced by llvm::TargetInstrInfo::getExtractSubregInputs(), llvm::ARMBaseInstrInfo::getExtractSubregLikeInputs(), llvm::TargetInstrInfo::getInsertSubregInputs(), llvm::ARMBaseInstrInfo::getInsertSubregLikeInputs(), and isVirtualRegisterOperand().